We offer all different kinds of Long Stay rental apartments in Rotterdam whereby we make the first difference in furnished apartments, decorated ones or empty. Most Riva Rental apartments come with fully furnished packages while others are just empty with no furniture. However, in case of an unfurnished apartment our furnishing would be able to furnish this in one week. 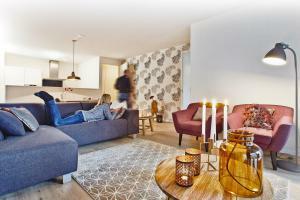 The choice of a Long Stay apartment is dependent on many factors such as the duration that an expat plans to stay in Rotterdam. While contacting us we will register your details and wishes. Afterwards a rental consultant from our dedicated Riva team will assist you. We will make every effort to only show apartments closely matching your preferences. Even if you are unable to find a suitable apartment in our portfolio, we are still able to provide you a solution. Our unique ‘househunt-service’ will save you money and a lot of time. Allow you to sit back and relax while our agents continue to search for the perfect house or apartment for you in Rotterdam. With over 10 years of experience in assisting expats regarding Long Stay apartments, a highly trained team and an extensive housing stock for rent, we have been the prefered housing agency for many companies relocating to Rotterdam.